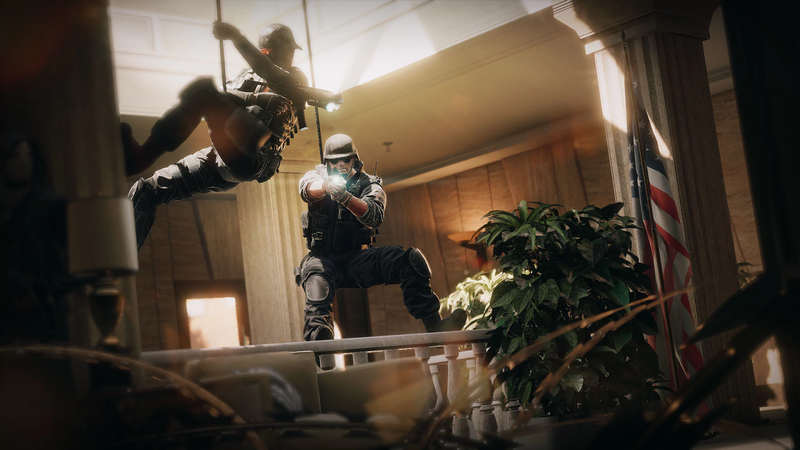 The last year hasn't been great for Rainbow Six Siege, a game that has recently become notorious for game-breaking bugs and exploits. The latest update, which came out this week, needs to convince people that Rainbow Six Siege is worth playing again. Thanks to the addition of powerful new operators that shake up the game in novel ways, it seems that Ubisoft has accomplished that goal. The White Noise update, which landed earlier this week, adds three new operators and a new map to the popular shooter. These operators have powerful abilities that shake up the game in fantastic ways, and I had a good time trying them all out. As many of you know, operators all have specific roles to fulfil during multiplayer missions. Some are focused on speed and stealth, while others are heavy tanks or long-range snipers. As the cornerstone of the Rainbow Six Siege experience, the prospect of adding more operators to the game promises to greatly change the way the game works. 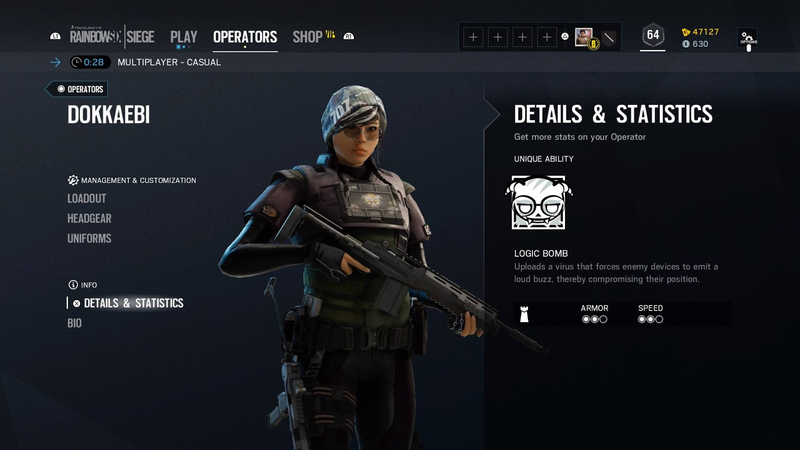 Let's start with Zofia, a new character who is actually related to another Siege character, Ela. Zofia has a new grenade launcher that can fire either concussive or explosive shots. This is super useful if you are playing a mission involving hostages, which you don't want to kill. Unlike other explosive attackers, like Ash or Fuze, Zofia is able to switch on the fly between explosives and stun grenades, giving her a lot of flexibility during missions. She also has access to one of my new favourite weapons in the game, a mid-range assault rifle called the M762. Zofia can also get up after being injured, but I didn't get much use out of this ability as Zofia only gets one health point after standing up. Still, you can catch some players off-guard with this ability. 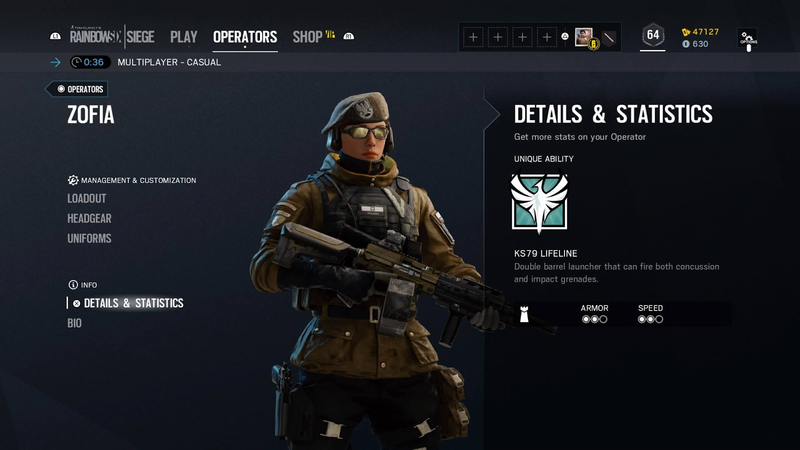 Pair her with a Doc, who can heal people and Zofia could be a strong operator. Zofia is particularly notable given that traditionally, Rainbow Six is all about teamwork — and Zofia can do a lot of damage on her own. 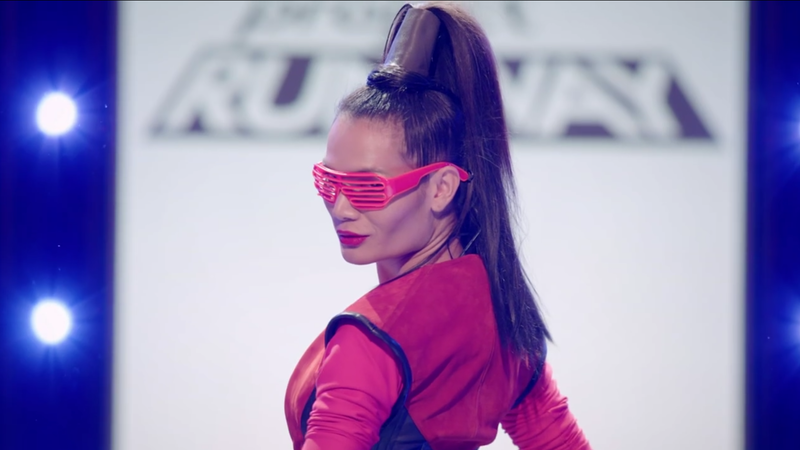 It's a good way to spice up the action. 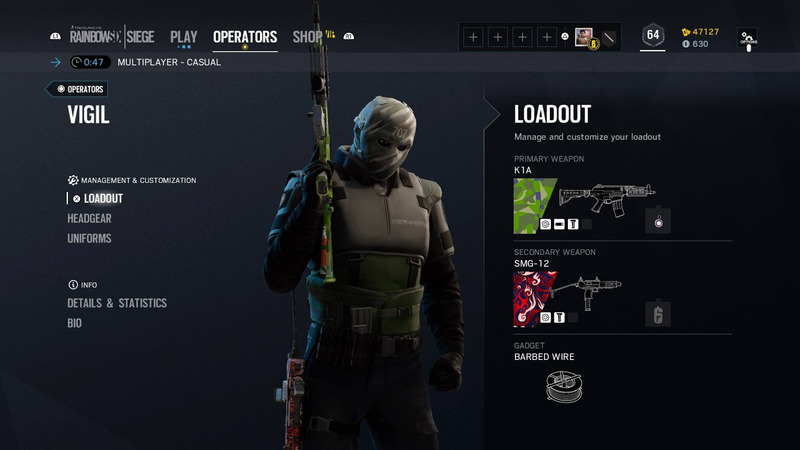 Another great addition to Rainbow Six Siege is Vigil, who looks like he fell out of an Army of Two game. Vigil has one of my favourite new abilities: he can cloak himself on enemy cameras and drones. 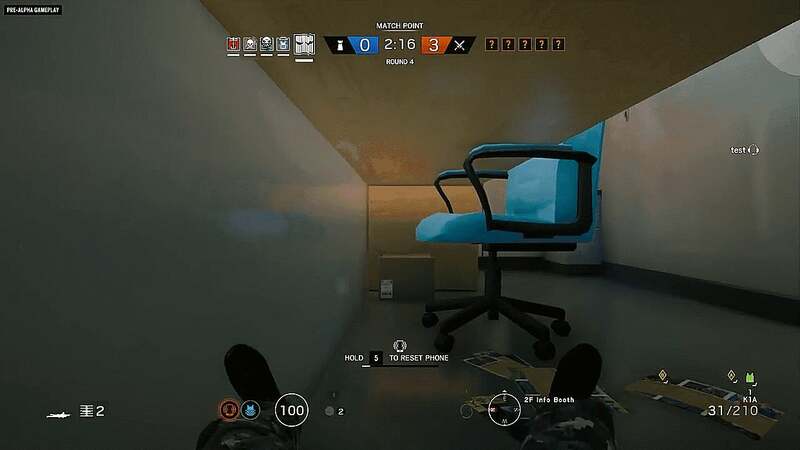 This is a powerful tool in Siege, as many players rely on marked enemies and drones. With Vigil, I got many kills just hiding in a room and watching drones roll by. Players would think the room was safe, only to get gunned down by me. Awesome. Playing against teams running a Vigil is nerve wracking as you can never be 100% sure a room is actually clear. Vigil seems like a direct response to the popular strategy of using drones and cameras. Even when teams are communicating, Vigil throws a wrench into everything: a teammate might call a room clear based on the camera feed, only to lead their friends into a deadly ambush. Vigil also makes unpopular operators like Thatcher more worthwhile, as Thatcher's EMP grenade can reveal a cloaked Vigil on camera. Here's a good tip for dealing with this new threat: Vigil's abilities creates interference. This is seen as white static on your screen, so make sure to pay attention. The final new character is my favourite new operator, Dokkaebi, a new attacker. Dokkaebi can actually hack the other team's phones and cause them to vibrate loudly. This instantly gives away the enemy location, and can only be stopped by holding down a button to turn the phone off. There are a few ways to counter this new ability. Echo, for example, is totally immune to the hack because in the Siege lore he and Dokkaebi are former partners. Still, being able to instantly screw with the entire team feels great. And if a player dies before turning off their phone, Dokkaebi can hack it to gain access to the defenders cameras, which is a nice bonus ability. Playing against Dokkaebi, you might have to shoot your own cameras to hide your position or shoot dead players' phones so they can't be hacked. These are both things I've never had to do before in Rainbow Six Siege. Finally, the other big new addition is the map Tower, which is pretty much exactly what it sounds like. The map feels tighter and less chaotic than other Siege maps, mostly thanks to a vertical layout. You can rope down from fast windows, or get shot from people hiding above you. It's also a map set almost entirely indoors, which means combat unfolds quickly here. Nearly every other map in Siege has outdoor sections where the attackers spawn. But Tower doesn't, instead spawning attackers on the only section of the map set outdoors, a small roof area. The update also fixed a huge number of bugs and glitches, like the one where players die after throwing an explosive.Ubisoft is currently trying out a solution to this deadly issue on test servers and will hopefully bring the fix to the main game in the near future. Despite being released two years ago, Ubisoft continues to expand Rainbow Six Siege — and all for free. (Season passes unlock new characters instantly, but they can also be earned by playing the game.) Despite that, there's been a growing concern within the community that Siege is not entirely the game it could be, and this train of thought wasn't helped by the addition of loot boxes, lag issues, and bugs. In Ubisoft's defence, they have been very active in the community, answering questions and taking feedback. White Noise seems like a step in the right direction: it mixes up the core gameplay while also fixing some glaring issues. All of this makes me more optimistic for Rainbow Six Siege's upcoming third year. I want to play this again with mates, but it always gives me an error and I find it boring playing with randos. I just recently started playing. If you're looking for group, I'd be down. I need people too. Evidence that the writer of this article has no clue? "Pair her with a Doc, who can heal people and Zofia could be a strong operator." Doc is a defender and Zofia is an attacker, they can never be on the same team, meaning never can be paired. Went down to the comments section for this. Unless he is a friendly Doc that is. The rest seemed decent, as well. 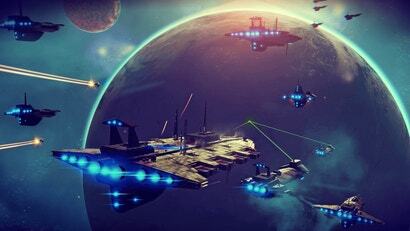 Kotaku, you know 'gamers' are going out of their way to make up excuses to condemn critics. Please don't give them easy ammunition. Ive been playing since beta, the game has never had "gamebreaking bugs". 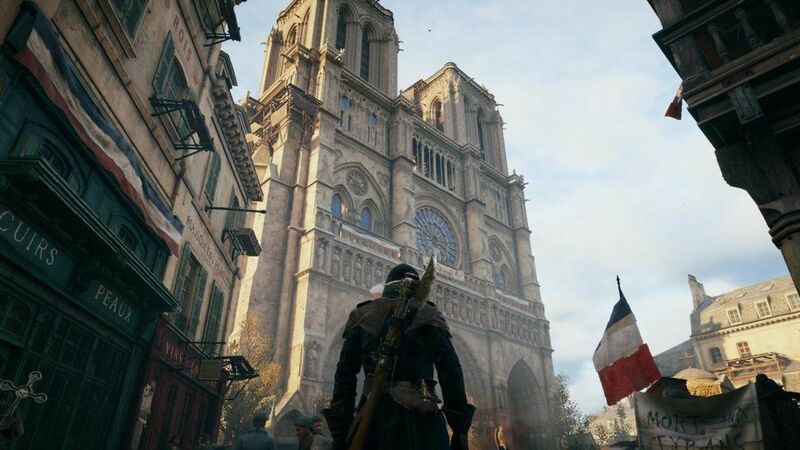 sure its always had balance issues but ubisoft has been constantly updating the game and it still remains one of the most original shooters on the market right now imo. call of duty titles dont ahve a community this active 2 years in thats for sure. "The final new character is my favourite new operator, Dokkaebi, a new attacker." Get the feeling he might be trying to tell us that there is a new, new, new attacking operating character!